Marcel is hot. Like, REALLY hot. I am all in favor of Marcel. Is it too early to buy an “I love Marcel” t-shirt? I still get chills every time Elijah shows his magnificent face on screen. Good chills. And maybe frightened chills as well. No one heart rips like our beautiful Elijah. People in the TVD world need to show him some more damned respect. And home boy rocks a three-piece-suit like no one else. Lord have mercy. Joseph Morgan continues to delight me. Klaus has been such a great edition to TVD and if The Originals is picked up, he will be sorely missed in Mystic Falls. If anyone has earned their own show though, it’s this guy. The way that they have pulled Haley into The Originals is pretty much the stupidest thing to have ever occurred on TVD and this is a show where precious stones are “hidden” in soap dishes. This pregnancy IS soap. I can’t even really discuss it without rolling my eyes. I have nothing against babies but I do not believe that they belong on my vampire shows. There were rumors about possible puppies on TVD ages ago and I threatened to stop watching if they became true. I’m not sure I can follow through with that, in this case, but I want to. Just. Wow. I don’t even know. What’s up with all of these rules? Are we going to get a copy of them? I feel that without knowing, I could possibly break one or 10 of them and endanger my own life, completely by accident. I like Camille. A lot. We will get more of her, yes? What are the chances we could just trade Elena for Katherine, full time? Katherine is the best of the best and I want her always. 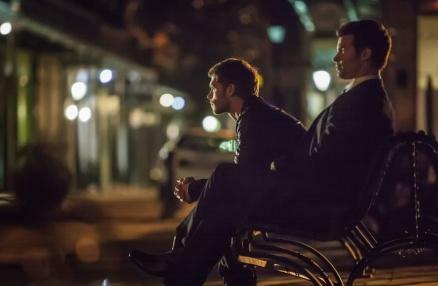 The downiest of the downsides of this episode going to show is the possible loss of the Klaus/Caroline stuff. Love me some Klaroline. That message he left her? How could she deny him? Without the THING THAT SHALL NOT BE NAMED, I am not sure what the other options were for pulling the Original family out of Mystic Falls and into this new world, but certainly there WERE other options? I am just really unsure about it and that’s unfortunate because I actually loved every other thing about this episode/pilot. The new characters are wonderful and we always need more time with the original vamps. Before watching this episode, I was having day dreams of all kinds of cross-over episodes in the vein of Buffy season 4/Angel season 1. That was some killer television. Can the TVD world pull it off? Or will the entire possibility reek like a dirty diaper?